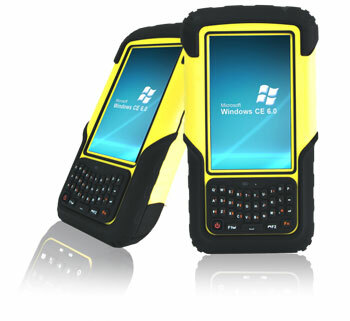 Winmate once again described the elegant S430T-CE with QWERTY keypad, simply calls 4.3" Rugged Handheld Device. S430T-CE is equipped with 4.3-inch display with sunlight readable resistive touch and the 35 keys QWERTY Keypad allows for rapid data entry in the field. Measuring 179 x 99 x 38 mm and weighing 450 gram, those are the statistics of what we consider a full-size rugged PDA/handheld computer and that's what the Winmate S430T-CE is. The S430T-CE is powered by a Texas Instruments OMAP3730 processor that can handle Windows CE. In terms of specific tech specifications, the OMAP chip in Winmate's latest is supported by 512MB of RAM, 512MB of Flash, a micro SD card slot, plenty of connectivity and expansion, and a powerful 18.5 watt-hour Li-Poly rechargeable battery good for full shift operation. For communication S430T-CE comes with 802.11b/g/n WiFi, Bluetooth v2.1 + EDR (no audio profile) and a built-in NEO-6Q GPS module. Optional equipment includes a 3G WWAN module supporting HSPA / UMTS / GPRS / WCDMA as well as a 1D/2D barcode reader or a low frequency (125 KHz) or high frequency (13.56 MHz) RFID reader. Note that it's either a barcode reader or RFID but not both. As its design and looks imply, the Winmate S430T-CE is a rather rugged machine. It can handle 4-foot drops to concrete, it has a wide operating temperature range of -4 to 140 degrees Fahrenheit, and it carries IP67 sealing, which means it's completely impervious to dust and is even protected against complete immersion (within limits). Please contact Winmate's local sales or visit the website for more details.